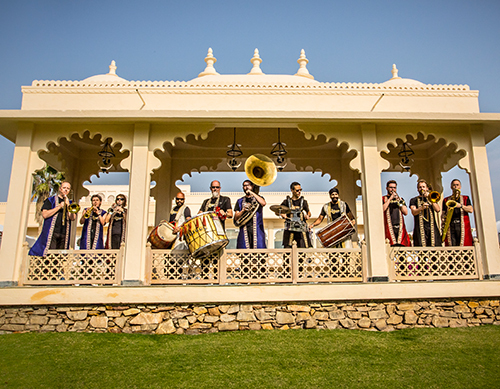 The Bollywood Brass Band is the UK’s pioneering Indian-style wedding band, playing the great tunes and compulsively danceable rhythms of Bollywood. 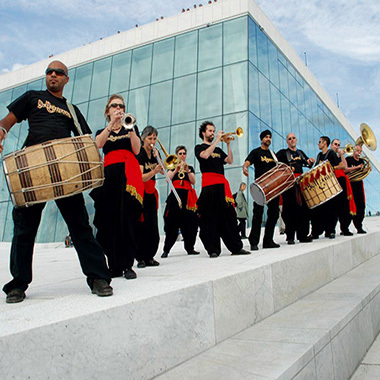 The band has performed all over the world – in venues, at festivals, and for Indian weddings in the UK, Norway, India, Thailand and South Africa. The BBB is versatile, playing both amplified stage sets and in a street formation, and they are equally at home headlining a festival or delivering exciting workshops in schools. Repertoire covers classics from the Golden Age of Bollywood up to current hits and stage shows can feature Bollywood film clips or a dancer to get your audience up and dancing. With brass, saxophone, dhol drums and a colossal sousaphone, the BBB is one of the most colourful, joyful and exhilarating acts around. SONGLINES - Trumpets and soprano saxophones blast out popular tunes and current or classic Hindi film hits, backed by drum-kit, raucous trombones, [and] improbably funky sousaphone bass-line …as popular as chicken tikka masala - Punjabi flavours and locally available ingredients mixed with Anglo-Saxon ingenuity. THE INDIPENDENT - One of the weekend's indisputable highlights (WOMAD's 10th Anniversary) was London's Bollywood Band who, despite reeling under the weight of tubas and Indian dhol drums, turned out to be a Jack in the Box like bundle of 11 cavorting musicians intent on blasting the genre into the 21st century. GLOBALVILLAGEIDIOT.NET - A.R. 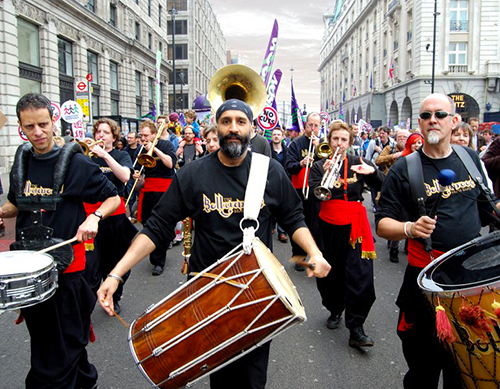 Rahman is one of the great modern Indian composers, and this second CD from the Bollywood Brass band certainly does his music justice, with some fabulously stirring arrangements, and great dhol playing to back up the brass. They know when to rage, and when to hold back, and they offer a new perspective on the music which is familiar from many films. Add to that four excellent remixes, and you've got an instant classic to keep the senses boiling and smiling. Absolutely stunning! 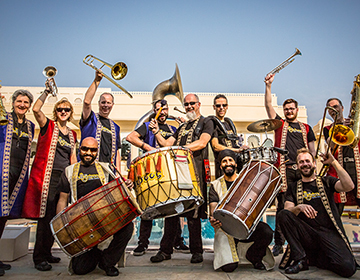 THE SUNDAY TIMES - CLIVE DAVIS - As traditional as bhangra and chips, some purists might say, but the repertoire of the Bollywood Brass Band forms a vibrant bridge between east and west. 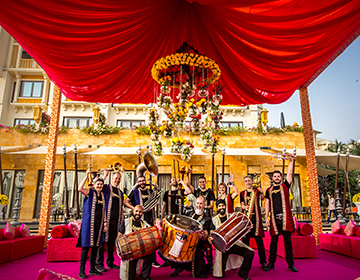 A multiracial set of strolling players, they have found a niche as Asian wedding specialists, as well as venturing onto the international festival circuit. Their new project nimbly plugs into the craze for over-the-top song-and-dance, Hindu-style: think of it, if you like, as a curtain-raiser for Rahman's forthcoming musical, Bombay Dreams. 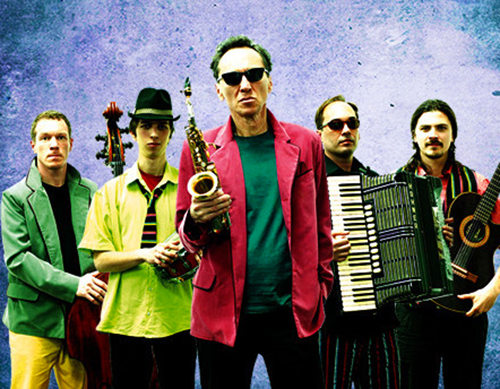 Irreverent, perspiring, kitsch-free and and never dull, the arrangements are the rumbustious, Ealing Rd equivalent of New Orleans's Dirty Dozen Brass Band. THE TIMES - NIGEL WILLIAMSON - This is a timely release given the fact that A. R. Rahman - to whose music this album is a tribute - is about to hit the West End next month as the composer of Andrew Lloyd Webber's latest blockbuster, Bombay Dreams. 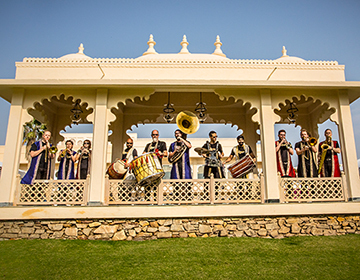 Back in India, Rahman is the biggest name in Bollywood, and the London-based Bollywood Brass Band have hit upon the ingenious idea of arranging a dozen of his best-known film tunes for their eight-piece brass ensemble. They are supported by a thunderous percussion section, but the melodies cavort with a playful inventiveness that reflects Rahman's compositional versatility. As bold and brash as you could wish.